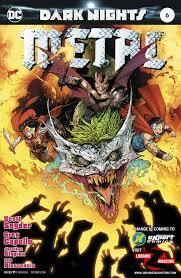 With this issue we finally reach the end of the interminable Dark Nights Metal series. The series had an interesting start but just kept getting more mired down in the dark and dismal story of... some kind of invasion from a dark universe that threatened to wipe out all life on Earth. Luckily, the Justice League members manages to find the McGuffins they need to fight back, and... well, you can sort it out. It all seems to be aimed at achieving two goals: restoring one or two long-lost heroes (and if you thought their origin was confusing before, wait till they try to recap this crazy quilt of a series); and getting the Justice League back together and chummier than ever. So the series wraps up with strong art and an impenetrable story. Not a great combination. As a wise person once said, your mileage may vary.